(VIDEO) HRH Crown Prince Frederik of Denmark Participates in an Open Water Swim Race. On Saturday, July 4, 2015, His Royal Highness Crown Prince Frederik of Denmark participated in the 2015 Vansbrosimningen in Vansbro, Sweden. The open water swim race is “…Europe’s largest open water event and [is] a part of the ‘en Svensk Klassiker’. The 3 kilometers race takes place in the Vanån and Västerdalälven rivers…” according to the Vansbrosimningen official website. This isn’t the first time the future king of Denmark has participated in a grueling physical race. On August 18, 2013, Crown Prince Frederik participated in the KMD Ironman Copenhagen which not only included the 3.8 kilometer swim, but also a 180 kilometer cycle as well as a 42.2 kilometer run. Click here to view photos from Saturday’s event. Click here to watch an interview with the crown prince. (VIDEO) News Regarding TIHs Crown Prince Naruhito and Crown Princess Masako of Japan. On Sunday, July 5, 2015, Their Imperial Highnesses Crown Prince Naruhito and Crown Princess Masako of Japan met with Japanese residents living in Nuku’alofa, Tonga. Yesterday, the imperial couple attended the coronation of His Majesty King George Tupou VI of Tonga. (VIDEO) His Serene Highness Prince Albert II of Monaco Celebrates the 125th Anniversary of the Automobile Club de Monaco. 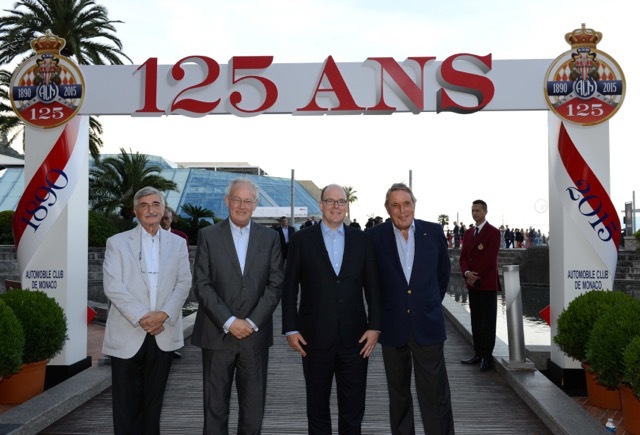 On Thursday, June 25, 2015, His Serene Highness Prince Albert II of Monaco celebrated the 125th anniversary of the Automobile Club de Monaco at the Grimaldi Forum in Monte-Carlo. (VIDEO) HSH Prince Albert II of Monaco Meets with the Press. Last Monday, His Serene Highness Prince Albert II of Monaco arrived at the Yacht Club de Monaco in Monte-Carlo where he held a press conference to discuss his 10 year reign as the sovereign prince and Head of State of Monaco. According to local journalist and Monaco socialite, Ms. Celina Lafuente de Lavotha, Prince Albert II also discussed his life as a father of twins, the lovely Princess Charlene, his passion for the environment as well as the upcoming film — still in pre-production — Royal Ice. The film will be directed by legendary writer, producer, and director, Mr. Garry Marshall. Please click here to read Ms. de Lavotha’s article about last Monday’s press meeting with the sovereign prince. (VIDEOS) The Coronation of His Majesty King George Tupou VI of Tonga. On the morning of Saturday, July 4, 2015, the coronation of His Majesty King George Tupou VI of Tonga took place at the Free Wesleyan Centenary Church in Nuku’alofa. Once the crown was placed upon His Majesty’s head he officially became the 24th Tu’i Kanokupolu, an ancient Tongan title that pre-dates the monarchy by centuries. Please click here to view a photo gallery from the newspaper, Matangi Tonga.